Table of Contents Next: Greenslade, J.W. The Green Islands (154.23E 4.50S) are a group of small atolls located north of Bougainville and east of New Ireland. The largest island of the group, Nissan, is nine miles (14 km) long and five miles (8 km) wide and encloses a central lagoon. This can be reached by two passes to the northwest. Nissan is fringed by reefs to the north and south, but there are suitable landing beaches on the east shore. The island is heavily vegetated, and while mostly flat, it has areas of raised ground on the east and south. The population was about 1147 Melanesians engaged in production of copra and taro. Nissan was occupied by the Japanese in early 1942. The only Allied military presence on the island was a coast watcher, C.C. Jarvis, who radioed the presence of an unknown ship at the lagoon entrance but was never seen or heard from again. Green Islands Landings. Following the success of the Bougainville and Cape Gloucester landings, the majority of the naval forces under Halsey were withdrawn to participate in the Central Pacific offensive. 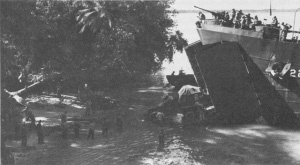 As a result, Halsey would not have sufficient naval support to land at Kavieng until April 1944. Concerned by the possible consequences of taking the pressure off the Japanese for three months, Halsey decided to take the easier objective of Nissan. This would keep the pressure up on Rabaul and would bring Allied air power within range of Truk itself. A reconnaissance by four PT boats on 10-11 January 1944 showed that the passes into the lagoon were 17 feet deep, sufficient for LSTs. A larger reconnaissance on 30-31 January by 300 troops of 30 New Zealand Battalion, accompanied by U.S. Navy specialists, were landed from destroyers Fullam, Guest, and Hudson. The reconnaissance showed that the lagoon was free of coral heads, that there were excellent landing beaches and a suitable airfield site on the east of the lagoon, and that there were only about 100 Japanese defenders (the precise figure was 72.) The indigenous population was hostile to the Japanese and so friendly to the Allies that the Allied command decided to omit any preliminary bombardment for the actual landings. Because the proper resupply echelons had not yet been organized, the recommendation of the reconnaissance force commander that his force seize the island at once was declined. The main landings went in on 15 February 1944 and were commanded by "Ping" Wilkinson, whose order of battle may strike the modern reader as overkill. The landing force consisted of 17 destroyers, 8 APDs, 12 LCIs, 7 LSTs, and a number of small craft. The landing force consisted of most of 3 New Zealand Division (Barrowclough), three Seabees, two "Acorns", and a number of other base units. The Japanese spotted the force on 14-15 February 1944, the night before the landings, and a strike by 32 aircraft from Rabaul damaged one of the cruisers in Ainsworth's covering force. A second strike by 15 unescorted D3A "Vals" arrived over the landing ships at 0641, shortly after the landing craft were manned. It was intercepted by 32 AIRSOLS fighters and cut to ribbons. The capture of the Green Islands further isolated Rabaul, and completely isolated the Japanese on Bougainville from any outside assistance.